Hot air ballooning is a relatively new adventure activity in India, but one that's fast growing in popularity. It's a thrilling way to experience India and get a different perspective of the country. Imagine having a calm and peaceful view of India's breathtaking scenery from a quiet place high above the crowds. Hot air ballooning isn't as scary as you may imagine either. It actually feels like you're as light as a feather as you float through the sky. It's an experience of a lifetime! And, doing it in India makes it all the more exciting and memorable. Where Can You Go Hot Air Ballooning? The desert state of Rajasthan is the most popular place for hot air ballooning in India. Regular flights currently operate around the iconic Pink City of Jaipur and the holy town of Pushkar. 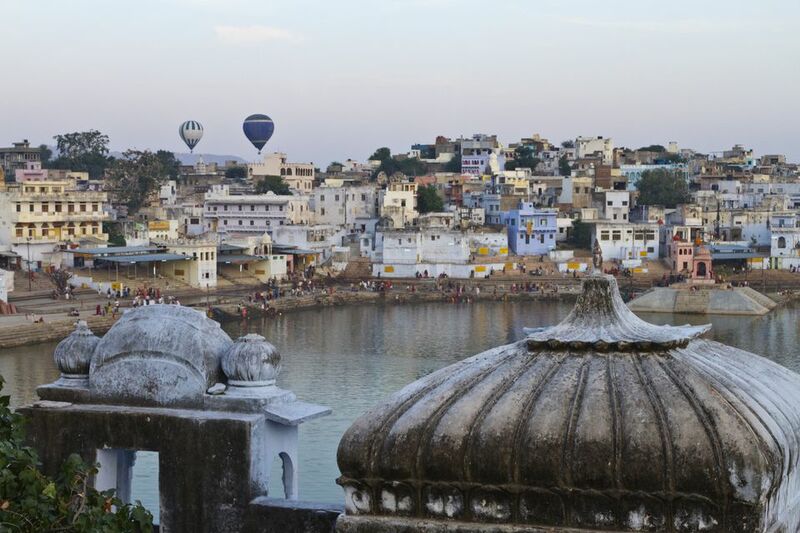 The annual Pushkar International Balloon Festival takes place during the Camel Fair, providing a bird's eye view of all the action. Elsewhere in India, there are regular balloon flights at mountainous Lonavala near Mumbai in Maharashtra, Neemrana near Delhi, and Chandor in south Goa. Other ballooning hot sports are the Araku Valley of Andhra Pradesh (where the second edition of the Araku Balloon Festival will be held in January 2019) and Pollachi in Tamil Nadu (where the annual Tamil Nadu International Ballooning Festival takes place in January). Tethered hot air balloon rides, whereby the balloon remains securely anchored to the ground, are also possible in many locations in India. However, these are more for entertainment rather than a proper hot air ballooning experience. Hot air ballooning in India is strictly regulated by the Directorate General of Civil Aviation. As a result, only a couple of companies have been able to meet the requirements and get a license to operate throughout India. The leading company that provides hot air balloon flights in India is Sky Waltz. The company's flights are operated by fully-qualified and experienced international pilots from the UK and USA. Tiger Balloon Safaris is also reputable and offers hot air ballooning in Jaipur and Goa (they have a separate website for their Goa operations). Wanderlust Travels organizes three-day balloon flight packages as well. Unfortunately, hot air ballooning isn't cheap! Prices range from 8,500-12,000 rupees per adult, per flight, for Indians. Foreigners can expect to pay $190-280. Children are about half this price. Flights usually last for a hour. Various extras are available, at an additional cost. This includes champagne, breakfast, banner with a special message, flowers, cake. In case you're wondering, there are a few reasons for the high price. Firstly, it's really expensive to buy a hot air balloon. There's also a limit on the amount of time a balloon can fly before it needs to be replaced -- typically, 400-600 hours, depending on how well the balloon is maintained and its passenger load. Hot air balloons require propane for their burners to heat the air. This contributes 10-20% of operating expenses. Other costs include ongoing pilot training, crew, and equipment to carry the balloon. It all adds up to a significant amount. Since the number of passengers per flight is restricted, along with the number of flights that can be undertaken in a day, the price per person has to be high to make it a profitable business. Balloon flights usually operate from September to the end of April, while the weather is dry and not too hot. If there's enough demand, the season can be extended up until June. In Goa, it runs from October until May. The flights leave early in the morning as the sun rises, and also in the evening before sunset. You should plan to set aside about four hours for your flight, including travel to and from your hotel. The ballooning company will pick you up from your hotel and transfer you to where the flight will depart from. What Clothing Should Be Worn? Hot air ballooning is an adventure activity, so do wear sturdy footwear. Depending on the time of year you go, a jacket might also be necessary as it can get chilly early in the morning. A cap and sunglasses may come in handy too.